The Airtame 2 is a digital signage and wireless presentation device designed for schools, offices, hotel lobbies, and other enterprise environments that value security and ease of deployment. As the name suggests, it’s an upgrade on the original Airtame device, offering beefed up specs for more reliable streaming, and the ability to display more complex websites. Available from Airtame.com for around $400. Note the inclusion of a 2.3A USB power adaptor: this is significantly higher than the USB port on your TV will provide, which is usually 0.5-1A. You should not plug the USB cable into your TV as it may result in damage to the port. Use only the adaptor provided. On the Airtame 2 you’ll find a USB-C and micro-USB OTG port (allowing an Ethernet connection with suitable adaptor); as well as a hole for a Kensington Lock. The latter is a new and welcome addition—the first Airtame model had no such physical security. One aspect I’m slightly disappointed by is the lack of PoE connectivity out of the box. Instead, the PoE to USB-C adaptor will come at a later date, as an optional purchase. For a product designed to be used in a corporate environment and costs as much as it does, I feel that should be included out of the box. Cabling for projectors and TVs is often kept discreetly inside the wall and ceiling panels, so having to find a socket for the power adaptor isn’t always going to be easy. 1920×1080 Full HD output @ 60FPS. The Wi-Fi functionality can either be used to connect the Airtame to a Wi-Fi network, or to broadcast its own ad-hoc network. Another trick up its sleeve is that when used as an ad-hoc network, the Airtame can proxy the internet connection to the client, so guests can maintain their internet connection while connecting directly to the Airtame. Note that there’s a single 5Ghz, and a 2.4GHz Wi-Fi chip. You can only only rebroadcast an ad-hoc network on the other channel that’s not currently in use. So if your device is connected to the 5GHz corporate network, it can only create an ad-hoc Wi-Fi for direct connections on the 2.4GHz channel. If using an Ethernet adaptor, both channels can be used for ad-hoc connections. Unlike the first Airtame which was light enough to be plugged directly into an HDMI port, the Airtime 2 is quite a bit larger, at half an inch thick and three inches wide. However, you have a couple of great mounting options out of the box: either magnetic, or permanent adhesive. Included is a powerful magnetic disc, which snaps directly to the back of the Airtame 2. It can then attach to any ferrous metal, such as you’ll find on the back of most TVs. This is the easiest way to mount the Airtame 2, but you’ll also find a layer of permanent adhesive on the magnetic disc itself. Should you wish, peel off the protective tape, then the magnetic disc can be affixed to any surface, such the top of a projector, or on the wall. The Airtame 2 device itself will still attach magnetically to this disc, but the disc will be permanently fixed. Attempting to remove it may result in damage to a painted surface or wall. Cabling the Airtame 2 is easy, as well. A single proprietary cable breaks out the USB-C port on the device to an HDMI and USB-A plug. Again: even if your TV has a USB port, do not plug the Airtame into it, you will damage the port. Use the included power adaptor, which outputs 2.3A @ 5V. Should messy cabling be a problem, you’ll also find some of the same adhesive midway along the cable, too. To set up the device, you’ll need a desktop or laptop. Head to airtame.com/setup to download the right software for your OS. I tested using a Mac, though the Windows procedure is virtually identical. Chromebook and Linux is also supported. Just plug in the Airtame and turn it on: the screen will tell you everything you need to know to get started presenting. This makes it great for guests to your facilities. Out of the box, AirPlay support is disabled. Which is a little odd, consider it’s listed on the website as the recommended way to share from an iOS device. You’ll need to go into the Device Settings -> Advanced -> AirPlay to enable it, then apply the changes. AirPlay support is officially in beta status. I found it pretty solid in areas that had decent Wi-Fi connection, but I did experience some hiccups in the poor reception areas between access points. A few times, the AirPlay output option was detected by iOS, but refused to play. Other times, it just crashed midway through a video, which required a full restart of the Airtame device to fix. Unusually, streaming from Android is more limited that iOS. 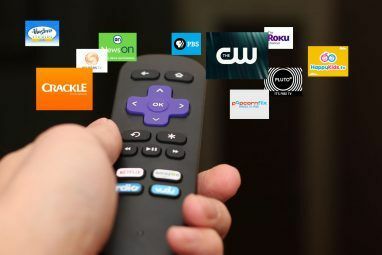 There is no Miracast support, and the only content you can present is pictures or documents loaded via the local device or a few cloud services. The Airtame Android app itself was last updated in 2015, and there is still no option for full device mirroring, or even video content, though it is on the roadmap. AirPlay is the easiest option here too, but the Airtame desktop app will give the best performance. You can opt to either stream your whole stream, or a single window. Unfortunately, the desktop app was unable to automatically detect the Airtame device. It’s possible my network was blocking certain broadcast packets, but it’s an enterprise-grade Ubiquiti UniFi What is Ubiquiti UniFi, and How Can It Fix Your Wi-Fi Woes? What is Ubiquiti UniFi, and How Can It Fix Your Wi-Fi Woes? Nearly everyone has experienced limited Wi-Fi functionality and poor coverage, especially in crowded areas. An Ubiquiti UniFi network could be the solution. Here's what you need to know. Read More setup, which is exactly the sort of network you’d find in offices and schools. Apparently it’s a common issue. Your only option on Windows is to use the desktop app, offering full desktop or selective window casting. Thoughtfully, Airtame also offers a “guest app”, which can be used if you don’t have admin rights. Our Airtame was detected immediately, and establishing a connection was fast and easy. It’s clear that wirelessly presenting from a desktop or laptop is the main use case, and where the most development effort has been pushed. Also of note from a security perspective is the ability to require a PIN code before a connection is accepted, meaning only those physically located in the meeting room will be able to present. 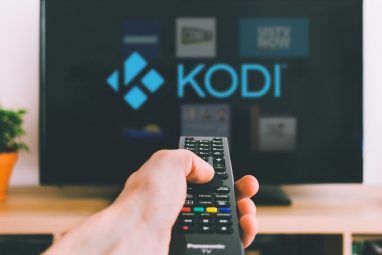 The PIN is output onto the display device, and must be typed into the client software–AirPlay or the native Airtame app–before the streaming can begin. When not actively used as a presentation device, the Airtame can be set up to display other content. You can fully customize the welcome message, or hide it completely. Then you can display a slideshow, or web content (such as Key Performance Indicator displays). You can either use a public URL (i.e. one that doesn’t require a login); or you can use one of the new “HomeScreen apps”. These require an Airtame Cloud account, which we’ll get on to shortly. When using the first option, you’ll also need to ensure that the URL isn’t going to automatically trigger an annoying GDPR popup, which requires the user to click to accept cookies before revealing the underlying website. Sadly, MakeUseOf is forced to use one of these, so I was unable to get it to display correctly. You can’t connect a keyboard or mouse to the Airtame, so you can’t click the message away or login. This is one of the biggest limitations of the Airtame device. 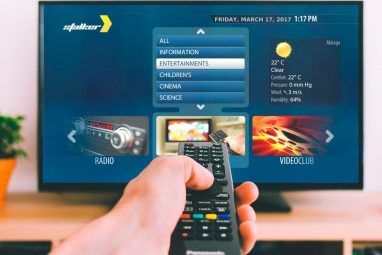 It shouldn’t be a problem if you own the website in question–you can likely code your own exception for a specific page, as well as craft the CSS to display in a larger format suitable for TV screens. Yes, we know this popup is annoying. To make full use of your Airtame, you’ll want to setup a free Cloud account. The Homescreen functionality is also currently free while in beta testing. At some point, it will become a paid subscription service, though no specific timeline has been given. To add your device to Airtame Cloud, click Add a new Airtame, then copy paste the provided cloud token into your device’s settings and apply the changes. It should shortly appear in the Cloud list of devices, and need only be done once for each device. Click on the Homescreen icon to the left of the Cloud screen to view the selection of apps available. If you have multiple devices, you can highlight all those you wish to change the settings, then click Edit. From here, you can switch apps, edit the default welcome text, and more. It’s really easy to deploy the same changes to all your devices, which is fantastic for large venues. If you have a specific device you’d like to compare to the Airtame, check out Airtame’s own comprehensive comparison page. Airtame is primarily for presenting slideshows, spreadsheets, and monthly reports, as well as the occasional video. Do You Need the Airtame 2? Corporate grade security. Both in software with WPA2 Enterprise Wi-Fi support, and physical hardware with the Kensington Lock slot. 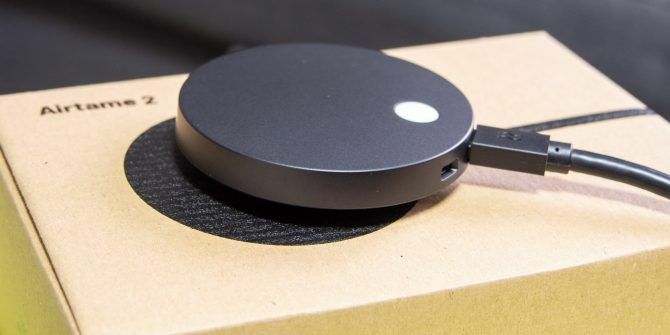 This isn’t a theoretical problem: thousands of Chromecasts were hacked to display a message encouraging viewers to subscribe to Pewdiepie’s YouTube channel. Remote management. Via the Airtame Cloud, your devices can be remotely configured from thousands of miles away, and changes deployed instantly. Scalability. One Airtame or thousands, it doesn’t matter: you can deploy updates instantly, to every device. Reliability. We’ve all seen a frozen Raspberry Pi loading screen in public places before, and it’s embarrassing. For those who value their time, the Airtame system is reliable. Airplay support can be buggy, but that’s typically true of any third-party device. Dual purpose. When not being used to present, Airtame defaults to your choice of welcome message and background content. If your business or school needs a simple way to present wirelessly, with rock solid security protocols and physical locks, look no further than Airtame. Explore more about: Apple Airplay, Media Streaming, Presentations. I just love the Amstrad CPC-464 on the background, it was my first computer !